Ron Quinton Racing :: Daysee Doom adds another win to her resume. Daysee Doom adds another win to her resume. Ron Quinton has developed a reputation as a master of apprentices and an imposing trainer of fillies and mares. 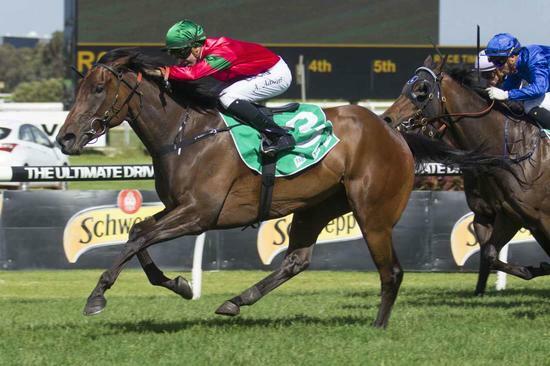 On Saturday at Rosehill the combination of both was on display when Daysee Doom ridden by 19-year-old Andrew Adkins justified Quinton's faith and that of the punters with a decisive win. Sent out the $2.90 favourite in the Club Marconi (1200m) Daysee Doom was held up to make a sustained run in the straight to win by 1-1/4 lengths from Nudierudie ($7.50). Although he had only a small team in work, former champion jockey Quinton knows how to get the best out of his horses and the young jockeys in his care. Adkins is the latest to come under his wing with Sam Clipperton graduating to Hong Kong racing and champion jockey Hugh Bowman among those to attend the Quinton school of racing. "Andrew rode her very well. He has learned to be more patient on them," Quinton said. "The winning post is at the far end not the top of the straight. "Daysee Doom has put together two nice wins now and I think I will give her a little holiday, just a couple of weeks, and look for some Listed races for her in the new year. "And if Andrew is nice to me he might even get to ride her." Daysee Doom's win was her fifth from seven starts with Clipperton riding her to her first three earlier this year and Adkins to her most recent two. "She has won from 1100 to 1400 metres but over the shorter distances this preparation they have been too nippy for her," Quinton said. "I think 1300 to 1400 is her best." Myer Classic at Flemington two weeks ago. "I will get her ready for the Coolmore Classic," Quinton said. Quinton won the 2012 Group One Coolmore Classic with Ofcourseican and again last year with Peeping who died prematurely in May after a bout with colic.